In the first week of the first trial related to the college basketball recruiting scandal more details have emerged that show its wide reach, touching several former college stars now currently in the NBA. Among the new revelations unveiled on Wednesday in the Southern District of New York, where Merl Code, Christian Dawkins and Jim Gatto are being put on trial for their role in the scandal, were alleged payments Dawkins, an aspiring sports agent, made to former Alabama star Collin Sexton, now with the Cleveland Cavaliers, and a job to Sexton's brother with annual built-in raises. Here's more details from Yahoo's Dan Wetzel. Oregon was also further implicated with allegations of payments from Dawkins to former Duck Troy Brown, who was drafted by the Washington Wizards with the No. 15 selection in the NBA Draft. Documents also suggested $5,000 to Troy Brown for "Mayweather tickets" and a proposed $2,500 per month for Lamar Peters. Lot of names tossed around in documents. The recent college hoops stars are but a few of the many names mentioned – and likely yet to be mentioned – in the first of three trials in the college basketball scandal. Kyle Kuzma and Markelle Fultz were mentioned briefly in a pre-trial hearing for jury selection this week. Former Clemson star Jaron Blossomgame was also looped into the fold as new documents came out on Wednesday. Blossomgame, who spent four years at Clemson, was allegedly provided $350 according to documents shown in court. 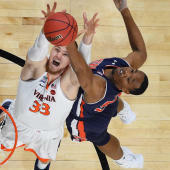 It remains to be seen how the programs attached to these current and former college stars will be affected as the trial unfolds, but the FBI's effort to prevent defrauding universities, in turn cleaning up a dark underbelly of college hoops, may inadvertently lead to a shakeup of the sport the likes of which many have never seen.